Those of us who are familiar with Lawren Harris have most likely been introduced to his modernist works at the Art Gallery of Ontario, where he’s placed with other artists from the Group of Seven, the alliance of prominent Canadian landscape painters from the 20s and 30s. 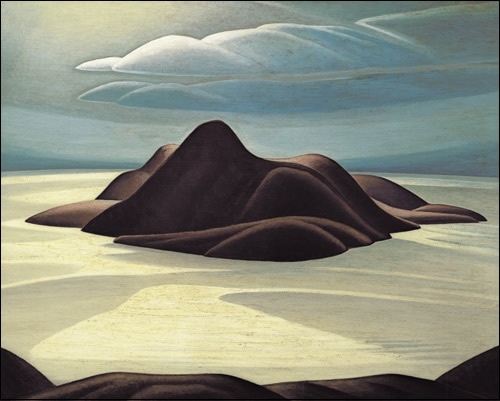 Harris’s idealized version of the northern frontier, simplified down to its raw forms of iced-over mountain, glaciers, islands, clouds, sunlight, and shadows, always seems to overpower the work of the other artists in the AGO galleries. Light often pours down from the clouds in these canvases giving the works a transcendent, almost spiritual quality. The reason why it’s such a delight to finally see Harris’s prominent paintings in a well-deserved solo show, the first in America. The exhibition is on the third floor of the Art of the Americas Wing, the first time in its five-year history that this part of the museum has held a temporary exhibition. The new director of the MFA, Matthew Teitelbaum, was formerly the director of the AGO for 22 years, and we can already see his imprint on the MFA by squeezing this show onto the exhibition slate. Thankfully, he chose a worthy introduction to Canadian modern art, Harris, who is guaranteed to impress far beyond the realm of Steve Martin. Martin broke up the show into the three regions of Canada that inspired the work of Harris—the northern shores of Lake Superior, the frigid Arctic waters off Baffin Island, and the lone peaks of the Canadian Rockies. 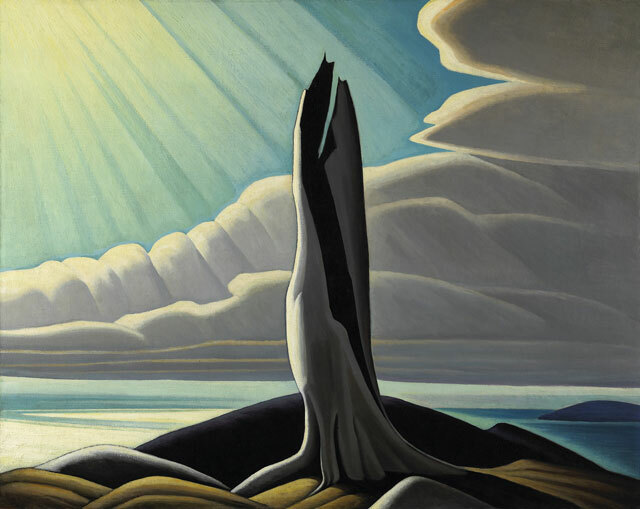 Canadian art lovers will be familiar with his iconic work, North Shore, Lake Superior (1926), where rays of light piercing down from the clouds illuminate a twisting dead tree. Another sparse landscape from his Lake Superior days is Pic Island (1924), a sensual and oversimplified mix of clouds, sky, island, and water. The only signs of civilization found in any of these works is an Inuit hut from one of Harris’s small scale Arctic paintings. Harris traveled through the Arctic on a government supply ship in 1930 with fellow Group of Seven artist, A.Y. Jackson. 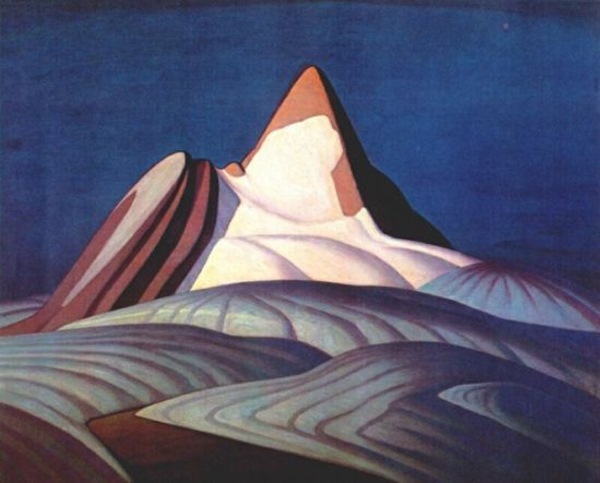 That same year, he would create two of his most striking works, both found in the last gallery which houses art from his time in the Canadian Rockies. Mt. Lefroy (1930) is a glorious iced-over peak rising mightily to its apogee, ridges of snow forming a hypnotic pattern on its slopes. Isolation Peak (1930) is a triangular peak, much like an Egyptian pyramid, reduced down to its basic elements, line, form, and color. Isolation Peak, like many of these mountain works, is a hybrid of real landscape and Harris’s vivid imagination. According to Andrew Hunter, Curator of Canadian Art at the AGO, Harris was greatly inspired by a trip he took to Scandinavia in 1913, where he found the works of painters who took a nationalistic pride in their country. Harris would run with this theme, creating Canadian landscapes central to the Canadian identity. “Harris’ vision is the ideal. Canada doesn’t look like this,” says Hunter. “This is a modernist expression of a sense of place.” With global warming taking firm grip in Boston this winter and barely a glimmer of snow on the ground, this idealized version of the Great White North feels fleeting indeed. All the more reason to spend a morning or afternoon immersed in its spectacular sheen. In his former life when print was king, Steve Jermanok was a columnist on the arts for Boston Magazine, a contributing editor for Art & Antiques, and guest editor of the arts issue for the Boston Globe Sunday Magazine. 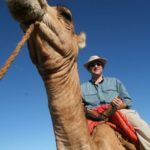 Now he’s happy to share his passion with the readers of Everett Potter’s Travel Report. Reach Steve at Active Travels.